From the time I first started swimming at Portland in about 2004 so much has changed, but I still enjoy it every bit as much as when I was little, attending as many training sessions as I can. I have many happy memories of spending my Saturday evenings with the Club at galas. In 2005 I took part in my first Club Championships and, in the 8 years that followed, haven’t missed one since. 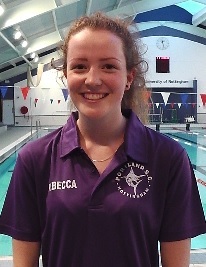 I have competed at the Nottinghamshire County Championships and many Open Meets during my time as a swimmer. I was made girls Vice-Captain in the 2010/11 season, then girls Captain in 2012/13 and finally Club Captain 2013/14. Growing up, I’ve tried and enjoyed lots of sports, but swimming is the one I’ve carried on doing regularly and it’s the one that, now as an adult, keeps me fit. After years of thinking about coaching, I completed my ASA level 1 training in March 2014 and look forward to teaching what I have spent so many years enjoying myself.